If you love 30-minute meals like kielbasa vegetable stir-fry, you will also enjoy this ramen bowl, easy peasy snow pea salad, sheet pan chicken and vegetables, and salmon rice bowl. This week I am making yet another 30-minute meal. My life, it seems, and kitchen are running on these quick and easy meals lately. With all of the demands of life, work, and family I love that I am still able to provide a healthy meal with less time in the kitchen. And without compromising taste/flavor. I do not enjoy flat tasting bland meals. At all. I’m sure most of you struggle to meet the everyday demands as well. Then, you come home and have to figure out what in the world is for dinner? Sound familiar? I spend most of my days cooking and still wonder the same thing! Let me help you get a balanced and nutritious meal on the table so you can spend more time with your family and not be slaving over a hot stove. Unless you want to be in the kitchen. Full disclosure, some days I like to hide there too. This particular recipe has been a go-to for me for months now. I’m amazed it’s not on the blog yet since I make it every single week. We all love this kielbasa and vegetable stir-fry and even my 4-year-old requests it! This isn’t quite a one pot meal, but cleanup is a breeze since only the rice is made in a separate pot. I prefer to make my rice in my instant pot since I can push a button and forget about it. 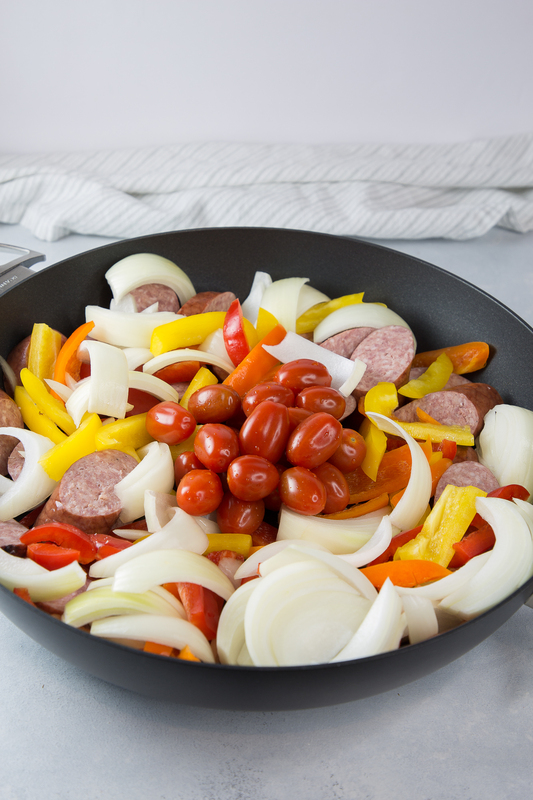 Ready to make this kielbasa vegetable stir-fry? Great! 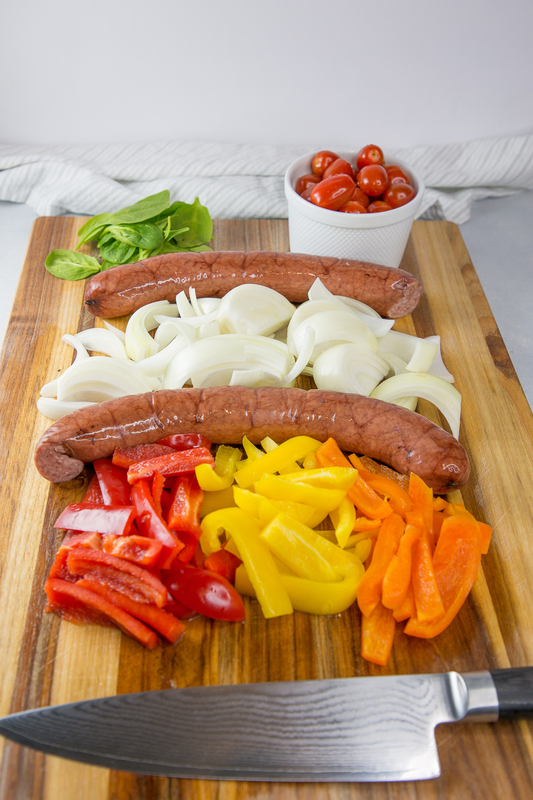 All you need is an onion, a package of multi-colored bell peppers, grape tomatoes (of any variety), your favorite kielbasa, spinach, and salt and pepper. Easy enough, right? You can even go off script and substitute with veggies you have on hand. Garlic adds a great flavor as well. Kale or swiss chard can also easily replace the spinach. Get creative and use what you have to create your own dish. Once you’ve prepped all veggies, just add them to a large nonstick chef pan, season with salt and pepper, and sauté. Add the kielbasa at the same time and allow the veggies to cook down uncovered. The tomatoes will burst and release their bright flavor into the dish. Be sure to start your rice before you begin prepping your veggies. By the time the sausage and vegetables are done cooking the rice will be finished as well. Combine in the pan and serve while warm. Kielbasa and Vegetable Stir-Fry Recipe: Easy and quick, this 30 minute meal is amazing! A quick, easy, and delicious stir-fry dinner that the whole family will love. Next PostNext Broasted Potato Wedges: The Best Homemade Fries Ever! Love quick, one pot easy midweek meals like this. Great healthy family midweek dinner. Adding kielbasa to stir fry is a fantastic idea! I need to try this! My grandparents are Polish and so I grew up eating kielbasa! Today, thankfully there is a vegan brand so I can still enjoy recipes like this without giving up the flavor of it. We looove fried rice n this is one of our fav combo. Love how easy and fresh the recipe looks. That is packed full of some of my favourite flavours. A great way to sneak some veg in too. This looks absolutely delicious and easy to make too! Wow This looks delicious ! Easy to prepare and yummy . Thanks for the recipe ! Mmmmm. Sausage and peppers are so classic and so delicious! This looks good. 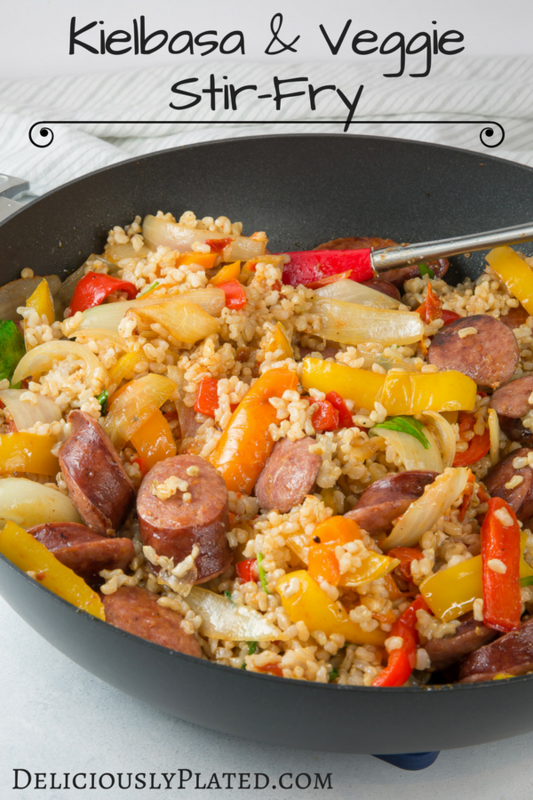 We eat kielbasa here often but never with a stir fry so this would be a new recipe for us. I make a similar dish with varying sausages and it’s soo good! This recipe looks so fresh and colorful! Stir-fry is one of our favorite meals, but haven’t had it with kielbasa. Can’t wait to try! This looks so incredibly yummy! Will definitely have to add it to my meal planning next week! I need to remember to use kielbasa more often–it’s such a great, quick meat. I love how colorful this dish is! Hahaha – yes, I spend my days cooking and still wonder what to eat for dinner, myself! This meals is the perfect fix – so delicious and it has kielbasa!!!! YUM!!!! Yes, publish that because I want to make it!! I’m such a sucker for any dish that has kielbasa in it. I need this in my life, stat! Thanks for the recipe. My family loves anything stir fried. I’d never heard of kielbasa before, it looks delicious! We love sausage stir fries, but we use chicken sausages so this looks like it’d make a great change! Oh this looks wonderful! My Polish husband is nuts for kielbasa so he would love it. 242 calories per 3/4 cup, maybe 1/2 cup? When someone wants to hide the calories they always leave the serving size blank. This is what we all know as cleaning out the frig. and using leftovers. I wouldn’t recommend to anyone that they consume smoked and processed meat products to include bacon but I don’t think you really care about health or other people or anything but silly little thumbs up. Bravo! A poor (unhealthy) recipe that is obviously just cut and pasted from the 70s probably. No imagination, no changes, nothing new, nothing original. No one should have received and paid for this what-so-ever. Wow, knocked at almost back to the pitcher before you were thrown out a 1/3 of the way to 1st. Three whole steps beyond a swing and a miss. I did, in fact, include the serving size. This recipe feeds a family of four. Thanks for your feedback.